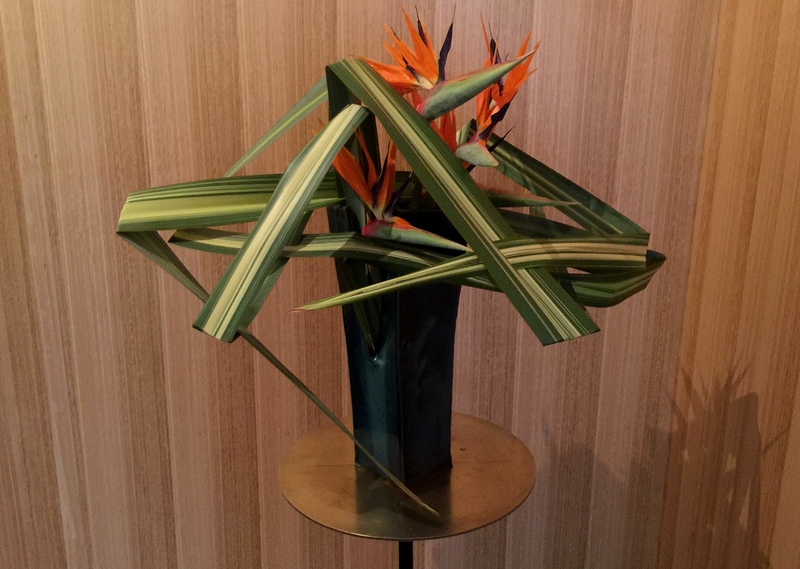 I made the arrangement, above, for our last Ikebana International meeting. 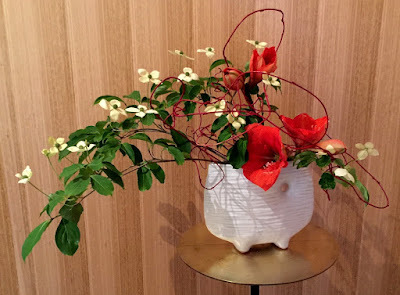 Usually, the mizuhiki is used as a final accent on a celebratory arrangement. However, I wanted to make more of a feature of it, using it as an unconventional material. The glass vases are such a striking red colour that I only use them for Christmas arrangements. For more photographs of that meeting please go to melbourneikebana.blogspot.com. In my last post I wrote about the training for Book 5 and workshops in Sydney. Misei Ishikawa Sensei demonstrated the correct way to arrange Japanese iris (Hanashobu, Iris ensata) and explained that in Japan the leaves of this iris are more expensive to buy than the flowers. And now I know why. I have a number of pots with this iris growing very successfully and, when I returned from Sydney, they were in full bloom. One of my first tasks was to cut and arrange them but, when it came to cutting the leaves, I found that most of them grow curved sideways or are quite floppy. In my arrangement, below I wanted to create a pond-like arrangement using three kenzans and three different groups of iris with leaves. As you can see, the leaves are not standing as vertically as they should. Last Tuesday, was the last meeting of our Sogetsu chapter, after which, I ran a workshop with the theme - 'Ikebana using Fabric.' I had suggested to the members to treat this as the theme 'Fresh and unconventional material' using the fabric as the unconventional material. It was a day of great weather extremes with the Bureau of Meteorology warning people to avoid unnecessary travel for fear of possible flooding. I was quite relieved to see the 13 members who braved the elements to attend. Once there, we had fun exploring this new material and the feedback I got was all positive. I had set up the three arrangements, below, as examples and I demonstrated the fourth. For more photographs of the workshop please go to our Sogetsu blog. Recently I agreed to make an arrangement for an exhibition by artist, Beau Emmett. His exhibition ran for five weeks and I was to maintain the arrangement for the duration. 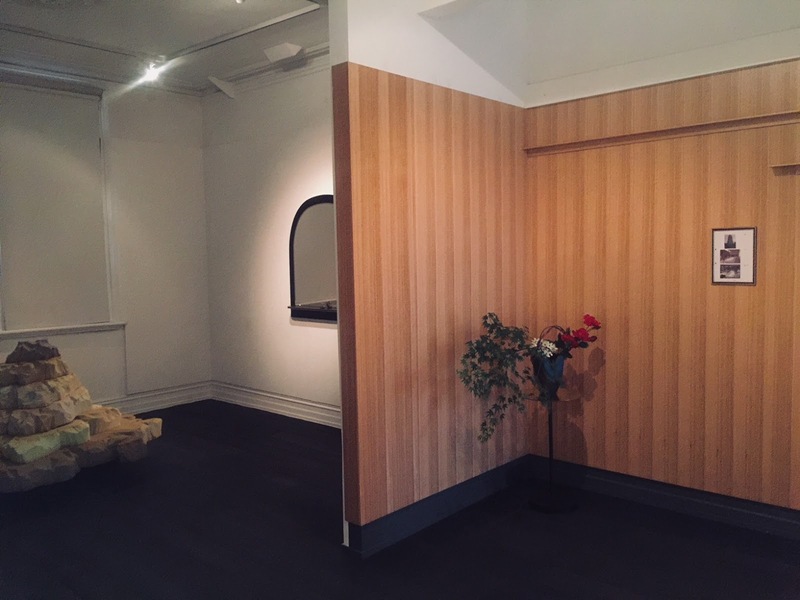 However, after replacing the original material in the first week, I felt it would be more interesting to make different arrangements each week. I leave you with this fun arrangement made last night by my student, Guy Pascoe, who is only in Book one of the curriculum but, who has studied fine arts and works as a florist for a large hotel. lily with vividly coloured plastic.